DTrue-to-life postures with vivid color schemes combined in a durable package designed for hard use. 60/40 Dura-Keel design guarantees a perfect ride in any situation. Over-sized and life-sized versions increase versatility which in turn amplifies drawing power to finish ducks in close. These decoys are the ultimate blend of economy and performance. These Sport-Plast Spooners are the perfect confidence decoy for those who love to hunt the pot-hole region of the country. 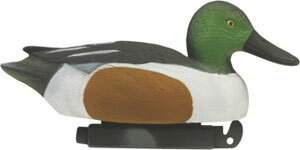 They also make great gag gifts for those hunters who have a hard time telling these ducks apart from Mallards "grin". 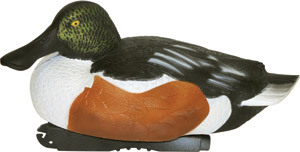 These decoys measure 13-1/2" from breast to tail and are packed 6 drakes and 6 hens per dozen. Designed by award winning master carver Don Mintz, Tanglefree’s Pro Series Puddle Ducks are perfect for targeting specific species or adding realism to any puddle duck spread. 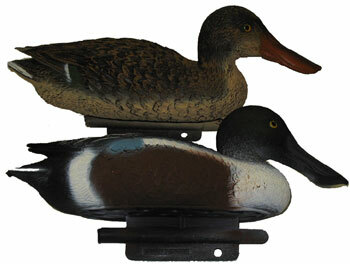 Decoys feature detailed texturing and color shadings that set them apart from other decoy manufacturers. Each species has a lifelike migration plumage using specific colors in conjunction with the carving’s natural feather shading. 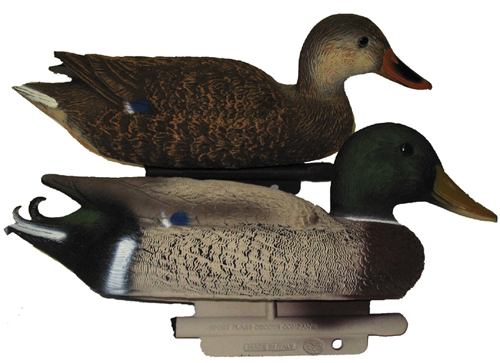 The durability of these decoy molds will provide many years of assured field performance. Finally the keel design guarantees upright stability and allows the decoy to naturally swim in the water. • Size: Skimmers 14.75" and Uprights 13"